Are you ready for a gorgeous new roof? 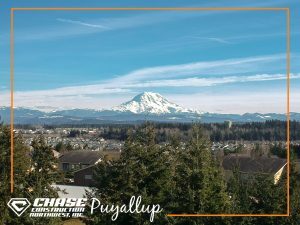 If you live in Puyallup and are prepared for the most reliable roof you’ll ever have, we’re here to make your vision a reality! Our roofers have strong ties to Puyallup and bring their incredible experience to every project. Whether you are looking for repairs or a full roof replacement, we will design a unique solution for your home. Clear communication. Do you remember the last time better communication would have fixed a potential problem before it arose? So do we! Communication is core to our business philosophy, and you can expect that we will diligently ensure smooth communication at every step of your roofing project. Professional technicians. Roofing can be messy. The roof replacement process typically involves removal of the entire existing roof, including all shingles, underlayment, and fasteners. This results in a deal of waste and unprofessional roofers may leave pieces laying around. Our roofers are extremely familiar with the importance of thorough daily cleanup and set it as top priority. Robust roof protection. Your roof is one of the most important components of your home because it’s the main line of protection from weather and sunlight. Our roofers use the most reputable roofing materials and the industry’s best roofing practices to ensure long-lasting durability of your installation. Terrific warranties. You’ll get real peace of mind when we install your roof. We provide the most thorough and longest duration manufacturer warranties in the industry, like the Golden Pledge and the Diamond Pledge. Convenient financing. With our attractive financing options, transform the upfront price of a roof into manageable monthly payments. Stunning beauty. Roofing technology has advanced enough that even asphalt roofing shingles and metal roofing panels beautifully replicate traditional roofing styles, like cedar shakes or Spanish tile. The architectural profile of our favorite composition roofing shingles gives roofs the attractive dimensional aesthetic that many homeowners love. Pride in their new roofs and in the great work we did together. When we install your new roof, your friends will definitely notice how great it looks! 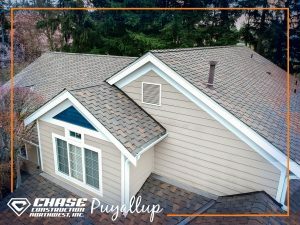 As a Puyallup roofing contractor with longstanding expertise in nearly all types of modern roofing, our installation services include architectural composition shingle roofing, metal roofing, flat roofing, liquid silicone roofing, deck waterproofing, and clay or concrete tile, cedar shakes, and slate roofing. Whether you prefer roof repair or full roof replacement, our roofers have the breadth of experience and depth of specialization for nearly every kind of project. Our Puyallup customers find the classic GAF Timberline HD architectural composition shingle roofing system the overall most attractive. When we install GAF Timberline HD, it’s a specialty system because of the kind of roofing contractor we are: GAF Master Elite. Less than 2% of roofers nationwide have qualified for this premier designation, and we have been one since 2011. Even as 39.1% of roofing contractors go out of business within the first 5 years of operation, we’ve been the highest credentialed for 8 years and counting. Upholding such high standards for so long for our Puyallup customers is a great point of pride for us! Each product we’ll use on your roof is high quality and manufactured by the most successful roofing manufacturing in the nation: GAF. Our roofers adhere to tried-and-true roofing practices learned from training, experience, and manufacturer testing. Many roofers in the industry cut corners without homeowners or manufacturers knowing about it. We’re the roofing company that GAF and homeowners in Puyallup call to fix the issues caused by improper installation practices. We provide the most attractive roofing warranty in the industry: GAF’s Golden Pledge. GAF pioneered the lifetime limited roofing warranties, and most other manufacturers have been trying to follow suit since. It is GAF’s confidence in roofing companies like us — Master Elites — that our roofing installations can feature the Golden Pledge. This warranty provides up to 50 years of coverage for leaks caused by material defect, as well as up to 30 years of coverage for leaks caused by workmanship. Our roofs give peace of mind because of the high quality products we use, our rigorous installation standards, and our clear communication with customers. WeatherWatch leak barrier. Critical leak areas need extra protection, like valleys where rainwater is directed to. We apply WeatherWatch in these areas because it is the most robust secondary protection for areas that receive the brunt of the elements. Tiger Paw synthetic hybrid underlayment applied across the rest of the roof deck to provide secondary protection for all non-critical areas. 15# felt paper is the traditional underlayment material, but it becomes too brittle over time and doesn’t function as the safest walking surface during installation. Tiger Paw is a truly reputable synthetic underlayment that performs and protects. Pro-Start starter strip roofing shingles. The perimeter edges of your roof, known as eaves (gutter line) and rakes (or gables) are extra vulnerable to weather damage and wind uplift. Rainwater or snow can seep over the edge and seep back under the shingles. Special starter shingles (and metal flashings) can help prevent this. Cobra continuous ridge exhaust ventilation. Attic condensation is a prominent issue in the roofing industry. It used to be that little attention was paid to it from roofing companies and homeowners alike, but then so many homeowners and roofing contractors began noticing water damage that appeared to be from leaks. The cause is condensation in the attic and the solution is proper ventilation. This keeps the attic at a cool temperature and pushes the dew point down into the insulation, helping prevent warm air from migrating out from your home and condensing during the transition. Both exhaust and intake ventilation are important for this process to function properly. We use Cobra exhaust vents (and Master Flow vents) and Cobra IntakePro as needed to help protect from condensation issues. Timberline HD field roofing shingles. These are installed across the entire roof, providing the chief source of protection from weather and sunlight, as well as the dimensional modern aesthetic. 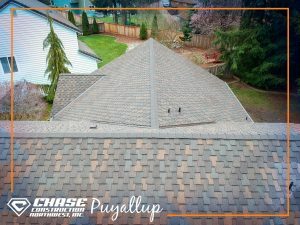 We have installed these shingles systems for hundreds of customers in Puyallup, and they love it! Z-ridge hip and ridge cap shingles. Designed to match the field shingles, these are installed over the continuous ridge vent along the ridge (peak) of the roof. Combined with appropriate flashings along every perimeter, penetration, and valley, the roofing system is complete. But that’s not the end of the benefit! Because we are GAF Master Elite, we can offer the Golden Pledge warranty previously discussed. With GAF Timberline HD, this gives 50 years of coverage for leaks caused by material defect and 25 years of coverage for leaks caused by workmanship. It’s the best warranty in the roofing industry! The workmanship portion of the warranty increases to 30 years with GAF designer shingles like Grand Sequoia or Grand Canyon. And they’re gorgeous! You’ll always notice a roof with this shingle style. While many homes have the dimensional design created by the layered profile and color variation of modern architectural shingles, designer shingles take it a step further. 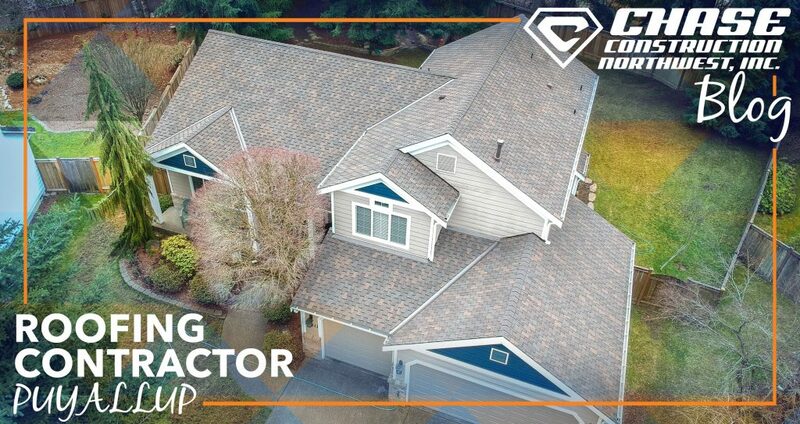 Closely replicating the cedar shake aesthetic, GAF designer shingles are particularly appealing to our Puyallup customers because of how well they contrast with Western Washington’s abundant rainforest nature. Each roofing system is unique. Even as the above components apply to most composition roofs, each home or business is different, and we design each system around their unique characteristics. We have been proudly roofing in Puyallup and the surrounding areas since 2002. Given the nature of the roofing industry, 17 years and counting is a really long and successful track record for roofing contractors. 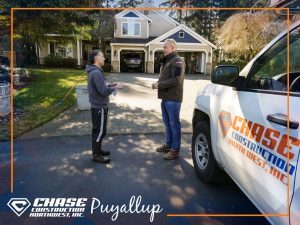 It would be great if more companies had longer track records of success because that would mean there are more top quality roofing installations for Puyallup homeowners. However, the fact of the matter is that there are plenty of roofing contractors that cut enough corners that eventually it catches up to them, and they go out of business. We’re a family owned business, and we plan on sticking around for future generations. This means that with every roof in Puyallup we put on, we have to make sure the job is done right. When mistakes are made, our roofers always correct them. This is one of the chief reasons we establish clear and prompt communication with all of our customers. We want to know exactly how good of a job we have done. And when that job is anything less than the best, we fix it. No roofing contractor is perfect, but we are always trying to do the right thing by our friends and customers in Puyallup. This is our home; we have many roofers, estimators, and project managers with deep roots in Puyallup and our beloved community. But don’t take our word for it, check out our customers’ video testimonials and reviews. Every week we get multiple calls from homeowners and business owners who found us because of our great customer reviews. Better Business Bureau and Google, and others do an indispensable service to us all by tracking customer experiences so well. Online reviews are a new rendition of the word-of-mouth referral. Check out our many reviews on any of those sites! The above GAF composition systems are typically installed on residences of the sloped style of most residential roofs and because of the overall package of composition shingles. But many homeowners have flat roofs or would prefer metal roofing for their homes. Fortunately, we specialize in both! A metal roofing system overall has the same component types as composition roofs, meaning they need underlayment, ventilation, perimeter flashings, etc.. Where they differ is in aesthetic, variety, and longevity. A common conception is that metal roofing is more costly than composition shingle roofing, but that’ not exactly true. Metal roofs last significantly longer and have other specific attributes like increasing home value that make metal roofs on par or even less costly than composition roofs over a lifetime. Along with how awesome standing seam metal roofing panels look, these are the two main reasons many of our Puyallup customers choose metal roofing. Flat roofing is more common among commercial structures because the buildings are so large that they are not constructed with any attic space. Many of the characteristics of flat roofs are distinct from sloped roofs. You’ll notice how you’ve never seen any flat roofs with shingles or any steep roofs with roofing membranes. The pitch of steeper roofs allows rainwater to drain at a quick enough pace that the non-welded seams between composition shingles is fine. But in flat roofs, the seams need to be welded such that the membranes are effectively one cohesive membrane. Multiple types of roofing can achieve this, mainly TPO, modified bitumen torchdown, liquid silicone roofing membranes, and PVC decking membranes. TPO is common when the existing roofing material is in bad enough shape that it needs to be removed. Torchdown is common as an overlay over an appropriate substrate roof. Liquid silicone roofing membranes are quickly growing in popularity because of their significant cost reductions and comparable lifespans to other flat roofing styles. PVC decking membranes are the most unique of the bunch since they apply to walking roofs like balconies, patios, waterproofed decks, and walkways. We’re a unique roofing contractor for Puyallup in that we specialize in every one of these. Our roofers have extensive experience with all sorts of dynamic projects with these styles. If you’re ready for an amazing roof, call us now! Or fill out our quick online estimate form. We want to know more about your roofing project and hope to be a part of it! GAF Timberline HD Birchwood with intake ventilation. Giving Back with Calvary Community Church. IKO Cambridge Pro-4 roofing Before and Afters. Tam Skylight installation for GAF Grand Canyon roof. Beautiful Custom Homes roofing with IKO Cambridge.